Dietary supplements containing L-arginine have been marketed with the purpose of increasing vasodilatation, and thus, blood and oxygen supply to the exercising muscle. The present study evaluated the acute effect of L-arginine supplementation on indicators of NO production, nitrite (NO2-) + nitrate (NO3-) (NOx), in healthy subjects. Plasma concentrations of asymmetric dimethylarginine (ADMA) and symmetric dimethylarginine (SDMA) have also been addressed. Seventeen healthy males participated in a randomized, double-blind, placebo-controlled study. Blood samples were drawn from a left antecubital vein at baseline (T0). Afterwards, subjects were randomly submittedto 6 g of oral L-arginine supplementation (as L-arginine hydrochloride) or placebo (as corn starch); afterwards, the subjects remained at rest in supine position and blood samples were drawn again at 30 (T1), 60 (T2), 90 (T3) and 120 minutes (T4) after supplementation. To analyze NO production, NO3- was converted to NO2- by nitrate reductase, followed by the derivatization of NO2- with 2,3-diaminonaphthalene. NOx, ADMA and SDMA were analyzed using a high-performance liquid chromatography system and monitored with a fluorescence detector. Two-way ANOVA with repeated measures showed no significant changes in NOx concentrations on the L-arginine group as compared to placebo group at any of the fivetime points (T0: 17.6 ± 3.9 vs 14.6 ± 2.3 μmol/L; T1: 15.8 ± 2.4 vs 14.3 ± 1.7 μmol/L; T2: 16.8 ± 4.9 vs 13.7 ± 2.7 μmol/L; T3: 16.7 ± 3.9 vs 14.6 ± 2.1 μmol/L; T4: 15.1 ± 2.8 vs 13.5 ± 3.5 μmol/L). Furthermore, plasma levels of ADMA and SDMA were not statistically significant between the L-arginine and placebo groups at T0 (0.43 ± 0.19 vs 0.39 ± 0.15 μmol/L and 1.83 ± 1.13 vs 1.70 ± 0.62 μmol/L), respectively. In conclusion, acute L-arginine supplementation does not increase plasma concentration of NOx in healthy individuals with normal plasma concentrations of ADMA. Many supplements have been introduced in the market with the purpose of enhancing athletes’ performance . Most of these supplements allegedly help athletes tolerate a higher degree of heavy training by helping athletes recover faster during intense sport training . Recently, supplements containing L-arginine have been introduced in the market claiming to promote vasodilatation by increasing nitric oxide (NO) production via nitric oxide synthase (NOS) activation. This vasodilatation would favor an increase perfusion as well as a higher nutrient and oxygen delivery to the active muscles during exercise, enhancing protein synthesis and muscle recovery . L-arginine is considered a semi-essential amino acid because the body normally produces it in sufficient amounts. However, supplementation may be needed in special conditions such as malnutrition, excessive ammonia production, burns, infections, peritoneal dialysis, rapid growth, urea synthesis disorders, and/or sepsis . Physiological concentrations of L-arginine in healthy individuals are enough to saturate endothelial NOS, which is ~ 3 μmol/L. Therefore, supplementary L-arginine should not promote increased enzyme activity; consequently, no further NO production should occur. However, there is evidence describing the NO-mediated biological effects associated with L-arginine supplementation despite the fact that nitric oxide synthase (NOS) is theoretically saturated with the physiological concentration of L-arginine—hence the condition known as the ‘L-arginine paradox’ . Early evidence suggests that L-arginine supplementation may help treat individuals with atherosclerosis risk factors, such as hypercholesterolemia, hypertension, diabetes mellitus, kidney failure, hyperhomocysteinemia, smoking, and aging—all of which are conditions that are associated with reduced NO biosynthesis [5–9]. Böger R.,  had shown that plasma levels of asymmetric dimethylarginine (ADMA), an endogenous NOS inhibitor, are increased approximately 2–3 fold in the pathophysiological conditions associated with cardiovascular disease. For this reason, elevated ADMA concentration may be one possible explanation for endothelial dysfunction and decreased NO synthesis in this disease cluster. Therefore, it appears that only subjects with poor NO synthesis are likely to benefit from L-arginine supplementation. Despite the theory regarding L-arginine supplementation improving vasodilatation from increased NO production, a recent review  about the ergogenic effect of L-arginine supplementation in healthy subjects shows that there were only five studies that evaluated exercise performance after acute L-arginine supplementation, three of which reported significant improvements. Besides the improvements observed in physical performance, the authors of these studies did not measure the underlying mechanism that could explain how the results obtained may have been due to increased NO production. Bailey et al.,  observed significant increases in the time to task failure with concomitant reductions in the O2 cost of moderate-intensity cycle exercise and slow oxygen uptake component amplitude on the group supplemented with 6 g of L-arginine, 1 h before a series of moderate- and severe-intensity exercise bouts for 3 days. Stevens et al.,  observed significant increase in peak torque, total work and fatigue index after supplementing with a product containing 6 g of L-arginine in three equal aliquots at 45, 30 and 10-min periods before isokinetic dynamometer exercise. Buford and Koch,  observed significant improvement of average power during repeated sets of supra-maximal exercise during cycle ergometer on the group that consumed 6 g of L-arginine. 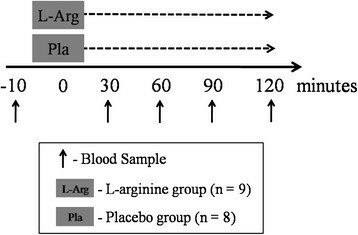 Based on the theory that physiological concentrations of L-arginine are enough to saturate endothelial NOS and no further NO production should occur in healthy individuals, it is our hypothesis that there should be no change inplasma concentration of NO2- and NO3- as a result of L-arginine supplementation when compared to placebo. Due to the fact that other studies have demonstrated vascular and exercise performance benefits after L-arginine supplementation in healthy individuals [2, 14], the question still remains as to whether this effect is NO-mediated. Therefore, in order to test the claim that L-arginine supplementation may increase NO synthesis, the present study was conducted to identify the acute effects of L-arginine supplementation on indirect markers of NO synthesis—NO2- and NO3-. It is to point out that, contrary to the present study, other studiesthat evaluated the effect of L-arginine supplementation on NO synthesis at rest have methodological limitations  (e.g. : They did not control diet for food contain NO2- and NO3-), which may cause flaws in the results. The plasma levels of ADMA and SDMA at the beginning of the study have also been addressed. Seventeen healthy males (25.5 ± 3.5 yr, 78.7 ± 10.5 kg; 176.1 ± 7.5 cm and 25.3 ± 2.3 kg.m-2 BMI) were recruited to participate in the study. All subjects were fully informed of the nature and purpose of the investigation and gave their written consent to participate. The exclusion criteria for participation in the study were any known cardiovascular, pulmonary or metabolic diseases (asthma, diabetes, hypertension, dyslipidemia etc. ), and the use of nutritional and pharmacological ergogenics. All experimental procedures were performed in accordance with the ethical standards of the Helsinki Declaration and were approved by the Institutional Ethics Committee of the Hospital Universitário Clementino Fraga Filho (protocol # 0118.0.197.000-10) from Rio de Janeiro, Brazil. In a randomized, double-blind and placebo-controlled study, subjects reported to the laboratory. Blood samples were drawn from an antecubital forearm vein at baseline after a ten-minute period of quiet rest in supine position. Afterwards, subjects were randomly divided into either a placebo or an L-arginine group and rested again in supine position in a quiet room. 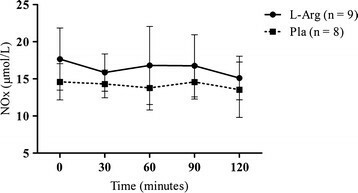 Blood samples were drawn again at 30 (T0), 60 (T1), 90 (T2) and 120 minutes (T4) after supplementation (see Figure 1). During this period, the subjects consumed no food and drink. One day before conducting the study, the subjects were oriented as to the NO2- and NO3- content of foods and were requested to restrict their diets from foods rich in NO2- and NO3-. A list describing foods and groups of food to be avoided and to be preferred was distributed to the subjects, in order to simplify their dietary choices for low NO2- and NO3- foods for the 24-hour period prior to the study. In short, the subjects were advised to avoid vegetable products, such as spinach and squash, which contain the highest amounts of NO3- per serving. Sweets, nuts, fats and oils contain very little NO3- per serving and were thus permitted. Red meat (beef, pork, lamb, mutton, and liver) and bean products contain the highest amounts of dietary NO2- per serving and were to be avoided. Negligible sources of dietary NO2- are found in cottage cheese, fats such as butter or margarine, and various fruit juices. This dietary orientation was based on a list developed to estimates of dietary NO2- and NO3-. Adherence to the diet was controlled by twenty-four-hour recall conducted upon arrival for the study, in which each subject was interrogated as to their dietary intake for the 24 h period prior to arrival for the study. Further analysis of energy intake and macronutrients (as a percentage of total energy) from the twenty-four-hour recall of each subject of both L-arginine and placebo groups was performed by using a nutrition analysis software program (dietWin Professional 2008 for windows, version 2.0, Porto Alegre, RS, Brazil). Ten minutes after baseline blood sample, all subjects were orally administered either 6 g of encapsulated L-arginine hydrochloride or placebo (as corn starch) in identical forms with 400 mL of H2O Milli-Q in a double-blind and randomized manner. We chose to provide 6 g of L-arginine, because such a dose would be well-tolerated when consumed orally, and was reported to increase vasodilatation . The blood was drawn from antecubital veins and collected in EDTA-containing tubes, and then immediately centrifuged at 3000 g for 10 min at 4°C in order to separate the plasma, before storing it at −80°C for later analysis. NO production was assayed by measuring plasma NO2- + NO3- (NOx) as previously described by Li et al. . In brief, plasma was diluted in a proportion of 1:10 and 1:100 in order to analyze NO2- and NO3-, respectively. After dilution, 1 mL of each sample were filtered using a 10-kDa cutoff ultrafilter (Vivaspin 2, GE Healthcare®) at 14000 g for 15 min to remove high-molecular weight proteins. NO3- was converted to NO2- enzymatically by nitrate reductase EC 1.6.6.2 (Roche Diagnostics, Mannheim, Germany) from Aspergillus species. The solution, which consisted of 200 μL of sample, 120 μM NADPH and 2 μM FAD, was incubated at room temperature for 1 h. Following the conversion of NO3- to NO2-, the sample was incubated at 24°C with 316 mM 2,3-diaminonaphthalene to convert NO2- into the highly fluorescent 2,3-naphthotriazole followed by addition of 2.8 M NaOH and immediately analyzed by high-performance liquid chromatography (HPLC). The HPLC device was equipped with a 5-μm reversed-phase C8 column Discovery® (150 x 4,6 mm, I.D.) guarded by a 40-μm reversed-phase C18 guard column Ascentis® (50 x 4,6 mm, I.D.) and a fluorescence detector model RF-10AXL (Shimadzu®) monitoring excitation and emission wavelengths at 375 nm and 415 nm, respectively. Both columns were obtained from Supelco (Bellefonte, PA, USA). The mobile phase (1.0 mL/min) was 15 mM sodium phosphate buffer (pH 7.5) and methanol. Oxidation of NO via several metabolic reactions results in the formation of nitrite (NO2-) and nitrate (NO3-) as the two major end products . The principal oxidation product of NO synthesis in aqueous solutions (in the absence of biological constituents such as hemoproteins) is NO2-. The further oxidation to NO3- requires the presence of additional oxidizing species such as oxyhemoproteins . For example, NO is quickly oxidized to NO2- via autoxidation in aqueous solutions, such as biological fluids, and may react with superoxide anions to produce peroxynitrites. In the presence of heme groups in proteins such as hemoglobin and myoglobin, NO reacts with oxyhemoglobin to produce metahemoglobin and NO3-. Therefore, measurement of NO2- and NO3- in various biological fluids turned out to be the most suitable, practical and reliable non-invasive method to assess systemic NO synthesis in vivo . The amino acids L-arginine, L-citrulline and L-ornithine were analyzed as previously described by Wu and Meininger . In brief, 50 μL of plasma was mixed with 50 μL of 1.5 M perchloric acid (v/v) to remove proteins. After 2 min at room temperature, 1.125 mL H2O and 25 μL potassium carbonate was added. The tubes were centrifuged at 10000 g for 2 min. The sample (25 μL) was mixed with 25 μL of the o-phthaldialdehyde (OPA) reagent solution (v/v) for 1 min. The solution derivatized was immediately analyzed by HPLC. The HPLC device was equipped with a 3-μm reversed-phase C18 column Kromasil® (150 x 4.6 mm, I.D.) guarded by a 40-μm reversed-phase C18 guard column Ascentis® (50 x 4.6 mm, I.D.) and a fluorescence detector model RF-10AXL (Shimadzu®) monitoring excitation and emission wavelengths at 340 nm and 455 nm, respectively. These chromatographic methods are highly sensitive, specific, and accurate, as well as provide a useful tool to study the L-arginine—NO pathway. The plasma concentrations of ADMA and SDMA were analyzed as previously described by Wu and Meininger . In brief, 200 μL of plasma was mixed with 100 μL of 1.5 M perchloric acid (v/v) to remove proteins, followed by 50 μL of 2 M potassium carbonate and 700 μL of phosphate buffer (pH 7.0). The whole solution was loaded into a solid-phase extraction column (Oasis MCX) and the elution solvent was removed using a sample concentrator system (Savant SpeedVac Concentrator, Thermo Fisher Scientific Inc.). The residues were suspended in 200 μL H2O. The sample (15 μL) was mixed with 15 μL of the OPA reagent (v/v) for 1 min. The solution derivatized was immediately analyzed by HPLC. The HPLC device was equipped with a Nucleosil 100–5 C6H5 column (250 x 4.6 mm, I.D; Manchery Nagel, Easton, PA) and a fluorescence detector model RF-10AXL (Shimadzu®) monitored excitation and emission wavelengths at 340 nm and 455 nm, respectively. All chromatographic procedures were performed at room temperature. 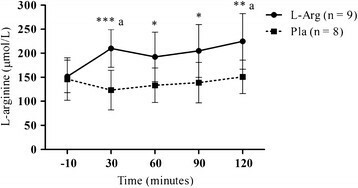 A Two-way ANOVA with repeated measures on two factors (2 x 5; group x time) was utilized to identify differences in NOx and plasma amino acids at each time point. Calculation of the integrated plasma NOx concentration [area under the curve (AUC)] was determined by the use of a trapezoidal method (baseline NOx concentration: y = 0). Unpaired Student t-test was utilized to identify differences in plasma concentrations of ADMA, SDMA and L-arginine/ADMA ratio at the onset of the study. Statistical significance was set at the 0.05 level of confidence. All analyses were performed using GraphPad Prism version 5.00 for Windows (GraphPad Software, San Diego California USA). At the study onset there were no significant differences between the randomly assigned placebo versus L-arginine groups with respect to age, height, body weight, BMI, body fat (see Table 1). The values are mean ± standard deviation. L-Arg = L-arginine supplemented group; Pla = Placebo group. Based on the evaluation of the twenty-four-hour recall, all subjects of both the L-arginine and placebo groups had apparently adhered to the dietary orientation and avoided all foods listed as high in NO2- and NO3-. There was no significant difference in energy intake and percentage of macronutrients before 24 h of beginning the study between L-arginine and placebo groups (2663 ± 508.5 vs 2905 ± 641.6 kcal; 52.9 ± 6.3 vs 53.6 ± 5.8% carbohydrates; 21.6 ± 4.8 vs 21.7 ± 5.1% protein; 25.5 ± 7.9 vs 24.7 ± 6.4% fat). Plasma NO2- + NO3- (NOx) concentrations at each time point are depicted in Figure 2. No significant differences were found between groups at any time point. Figure 3 presents the data for the total integrated NOx AUC during the 120 min post supplementation period. The integrated AUC revealed that despite a 15% higher, the L-arginine supplementation did not resulted in greater NOx response than placebo group over the time (P > 0.05). Plasma NOx concentrations (μmol/L). No significant change was observed between groups at any time point. 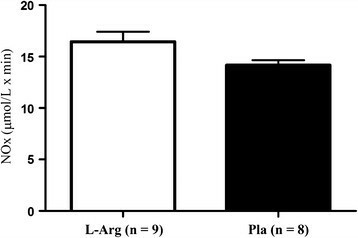 L-Arg = L-arginine supplemented group; Pla = Placebo group. Total integrated NOx area under curve during the 120 min post supplementation period. No significant change was observed between groups over the time. L-Arg = L-arginine supplemented group; Pla = Placebo group. The plasma concentrations of L-arginine, L-citrulline and L-ornithine at each time point are depicted in Table 2. No significant difference between groups was observed at baseline. Plasma L-arginine increased significantly at 30 min (209.9 ± 39.1 vs 123.3 ± 44.6 μmol/L, P < 0.001), 60 min (192.3 ± 51.3 vs 133.4 ± 36.0 μmol/L, P < 0.05), 90 min (204.9 ± 55.1 vs 138.8 ± 42.2 μmol/L, P < 0.05) and 120 min (224.7 ± 57.8 vs 150.8 ± 34.8 μmol/L, P < 0.01) after supplementation in the L-arginine group, when compared to the placebo group (see Figure 4). No significant change was observed between groups in plasma L-citrulline and L-ornithine at any time point. The values are mean ± standard deviation. The symbols ***(P < 0.001), **(P < 0.01) and *(P < 0.05) denotes significantly different from placebo at same time point; a denotes significantly different from time −10. L-Arg = L-arginine supplemented group; Pla = Placebo group. Plasma concentration of L-arginine. The symbols ***(P < 0.001), **(P < 0.01) and *(P < 0.05) denotes significantly different from placebo; a(P < 0.01) denotes significantly different from 0 minutes. L-Arg = L-arginine supplemented group; Pla = Placebo group. At the onset of the study, there were no significant differences in plasma levels of ADMA, SDMA and L-arginine/ADMA ratio between the randomly assigned placebo versus L-arginine groups (0.43 ± 0.19 vs 0.39 ± 0.15 μmol/L and 1.83 ± 1.13 vs 1.70 ± 0.62 μmol/L) (see Table 1). Dietary supplements containing the semi-essential amino acid L-arginine (the only substrate of NOS) have been introduced in the market, claiming to promote vasodilatation by increasing production of NO. In the present study, we found that in healthy subjects 6 g of oral L-arginine supplementation did not stimulate an increase in NO production when compared with the placebo group. Additionally, no significant increases were observed in plasma L-citrulline, which is the by-product of NO synthesis from L-arginine. Furthermore, no significant differences in plasma concentrations of ADMA and SDMA at onset of the study were observed between the L-arginine and placebo groups. Several studies had showed no significant difference in NO production (measured by NO2- and NO3-) after L-arginine supplementation [22–24]. Liu et al. did not observe any significant differences in plasma NO2- and NO3- concentrations after orally supplementing ten healthy male athletes with 6 g of L-arginine (as free form) or placebo for 3 days. Koppo et al. observed no significant difference in urinary NO2- and NO3- after 14 days of supplementing seven physically active healthy males with 7.2 g of L-arginine hydrochloride (3 × 3 capsules of 805 mg), and Tang et al. also did not observed any significant difference on NO synthesis (measured by plasma NO2- and NO3-) in eight healthy young men after an single dose of 10 g of L-arginine. Since all subjects of these studies were submitted to exercise, the results of these studies are not surprising due to the very nature of the underlying mechanism of NO synthesis: vascular shear stress is considered the main stimulus for endothelial NO production during exercise . Therefore, there should theoretically be no need for supplementary L-arginine to synthesize NO during exercise. Regarding studies at rest condition, Blum et al. investigated the effects of oral L-arginine (9 g daily for one month) on NO bioactivity in 10 healthy postmenopausal women. After the supplementation period, the authors observed no significant difference in serum NO2- and NO3- concentrations. In another study, Evans et al. also did not find significant differences in serum NO2- and NO3- concentrations after submitting twelve healthy subjects to take L-arginine for 1-week periods at daily doses of 3, 9, 21, and 30 g. Schwedhelm et al.,  published a study with the purpose of investigating the pharmacokinetic and pharmacodynamics properties of oral L-arginine with regard to NO metabolism. Twenty healthy subjects were submitted to two doses of L-arginine supplementation (1 g of arginine sustained-release tree times per day or 1.6 g of immediate-release arginine two times per day) for 7 days. At baseline and on day 7, a single dose of L-arginine supplementation (half of the total daily dose, respectively) was administered and blood samples were drawn at 0, 0.5, 1, 2, 3, 4, 6, 8, 12, 16 and 24 h after supplementation. The authors observed no significant differences in urinary excretion of nitrate at any time point, despite increases in plasma L-arginine concentrations after the supplementation (Tmax = 3.7 ± 1.3 h for arginine sustained-release and 0.7 ± 0.1 h for arginine immediate-release). In the present study, the plasma L-arginine concentrations increased significantly after 30 min of L-arginine supplementation when compared to placebo group, and maintained high throughout the study period. Furthermore, no significant differences were observed in plasma concentrations of L-ornithine and L-citrulline at any time point between the groups. It is important to point out that, contrary to the present study, neither of the above mentioned studies controlled the intake of food rich in NO2- and NO3- from subject’s diet before or during the study. Most NO2- and NO3- comes from diet (vegetable products contain the highest levels of NO3-; meat and bean products contain the highest levels of NO2-), which may alter the results of the analysis. Thus, endogenous synthesis of NO may not be adequately measured by NO2- and NO3- in plasma and urine if the diet is not controlled. Measurement of NO2- and NO3- in various biological fluids turned out to be the most suitable, practical and reliable non-invasive method to assess systemic NO synthesis in vivo . In the present study, NO synthesis was quantified by measuring plasma NO2- + NO3- (NOx) via high-performance liquid chromatography. Most of the studies [22–24] had analyzed NO synthesis by using Griess reaction. The acidic conditions under which experiments using Griess reaction are conducted favor the formation of S-nitroso compounds from NO2- and reduced thiols. Thus, the measurement of NO2- and NO3- in biological fluids by assays based on the Griess is subject to interference by many substances acting at different places in the Griess reaction and the following spectrophotometric measurement in the same wavelength (normal absorbance at 540 nm). Therefore, studies using Griess reaction to detect stable metabolites (NO2- and NO3-) to measure NO synthesis may have significant methodological limitations, as compared to fluorometric techniques associated with HPLC. Bailey et al. observed significant increases in plasma NO2- after supplementing nine healthy recreationally active men with a supplement that contained 6 g of L-arginine (dissolved in 500 mL of water) as compared to placebo. It is important to note that this study associated other amino acids besides L-arginine, including L-citrulline (quantities not expressed in the study), which have been shown to increase NO production, as measured by plasma concentrations of NO2- and urinary excretion of NO3- and cGMP . Interestingly, the authors did not measure plasma NO2- at baseline; they had just done so 1 hour after supplementation, which is a major methodological limitation, since it is not known whether there were any differences in the samples prior to supplementation. Furthermore, taking into consideration that diet can influence nitrite plasma concentrations, no dietary control to limit the consumption of foods rich in NO2- and NO3- was conducted. Others studies also have showed improvements in NO production by using L-arginine supplementation [30–33]. However, all of these studies had administered L-arginine in subjects with some cardiovascular risk factors or cardiopathy. It appears that L-arginine is a limiting factor for NO synthesis in patients at risk for atherosclerosis, but not for healthy individuals . Therefore, L-arginine supplementation may be necessary only for individuals with atherosclerosis risk factors. Among the possible explanations for this phenomenon is the presence of high levels of asymmetric dimethylarginine (ADMA), an endogenous NOS inhibitor. Higher concentrations of ADMA were encountered in individuals with atherosclerosis, as well as in individuals with atherosclerosis risk factors, such as hypercholesterolaemia, hypertension, diabetes mellitus, kidney failure, hyperhomocysteinaemia, smoking and aging . Physiological levels of L-arginine and the presence of normal concentrations of ADMA saturate the endothelial NOS enzyme, promoting NO production. In these conditions, L-arginine supplementation does not affect enzyme activity. In contrast, in the presence of elevated plasma concentrations of ADMA the endothelial NOS activity diminishes, resulting in lower physiological levels of NO production. SDMA has no effect on NOS activity but may compete with L-arginine for the y + transport system . Under these conditions, L-arginine supplementation may re-establish the L-arginine/ADMA ratio in order to activate endothelial NOS . Therefore, L-arginine supplementation may exert a beneficial effect on vascular function. In the present study, we observed no significant difference in plasma concentrations of ADMA, SDMA and L-arginine/ADMA ratio at baseline between the groups. This finding may explain the absence of significant changes in NO production after L-arginine supplementation. The baseline plasma concentrations of ADMA observed in the present study are similar to previous studies in healthy subjects which reported ADMA concentrations ranging between 0.3 and 0.9 μmol/L [36–38]. Therefore, it may be speculated that there should be no further increase in NO production after L-arginine supplementation in subjects with normal levels of ADMA. Böger et al.,  observed that plasma ADMA levels were significantly higher in hypercholesterolemic subjects than in normocholesterolemic control subjects (2.17 ± 0.15 and 1.03 ± 0.09 μmol/L, respectively); and the higher levels of ADMA was associated with reduced NO synthesis. Therefore, it appears that high plasma ADMA concentrations may inhibit NOS enzyme, but low or normal plasma ADMA concentrations do not affect NO synthesis. In conclusion, L-arginine supplementation does not increase NO production in healthy subjects with normal plasma ADMA concentrations. Therefore, it is not advisable to recommend dietary supplements containing L-arginine for the purposes of increasingacutely NO production in healthy subjects. This result does not discard the possible effect of L-arginine on NO production in individuals with pathophysiologicalconditions (e.g. : hypercholesterolaemia, hypertension, diabetes mellitus, kidney failure, hyperhomocysteinaemia, smoking and aging) and long-term studies are needed to identify whether L-arginine may provide some benefit. This work was supported by a grant from The Research Foundation of the State of Rio de Janeiro - FAPERJ (grant No. E-26/102.384/2009). TS Alvares received a research productivity scholarship from CNPq (No. 382295/2010-2). The authors would like to thank Ricky Toledano for the preparation of the English version of the manuscript. Each author certifies that he or she has no commercial associations (e.g., consultancies, stock ownership, equity interest, patent/licensing arrangements, etc.) that might pose a conflict of interest in connection with the submitted article, except as disclosed on a separate attachment. All funding sources supporting the Work and all institutional or corporate affiliations of the authors are acknowledged in a footnote in the Work. TSA contributed substantially to data acquisition and chromatographic analysis, statistical analysis and data interpretation, and was the manuscript writer. CACJ contributed substantially to chromatographic analysis, interpretation of results, and reviewing the manuscript. JTS contributed to data interpretation and manuscript revision. VMFP contributed to data interpretation and manuscript revision. All authors read and approved the final manuscript.